I would like more information about 46 Barr Lake Circle. Supplemental Remarks: is perfect of entertaining friends or family with the kitchen nearby. 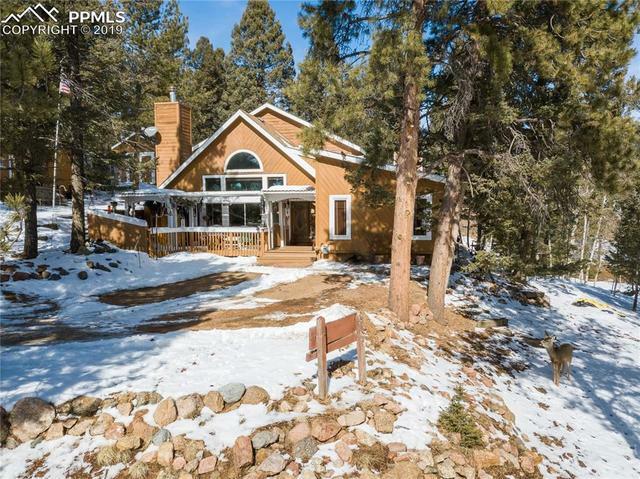 The gourmet kitchen boasts tile floors, upgraded cabinet hardware, newer stainless steel range/oven, trash compactor, under mount sink, slab granite counters, breakfast bar w/stacked stone wall, custom tile backsplash, modern lighting & more! The main level master suite has all the luxuries; sitting area, walk-out deck access, private 4pc bath w/oversized shower, dual vanities, tile floor & huge walk-in closet w/ shelving. Additional main level bedroom has easy access to updated hallway full bath. The hall bath boasts tile floor & shower surround, basin sink, eco dual flush toilet, & updated vanity hardware. The other 2 upper bedrooms have views of the landscape & share updated full bath w/ basin sink, & tile floor/shower surround. Comfort abounds-relaxing inside or out. In the summertime enjoy the outdoor living spaces. The front deck offers great views of Pikes Peak. Sit back & enjoy Colorado living. Other bonus features include; energy efficient vinyl windows, new 2 car tandem garage w/electric, new water heater, & more. This home is a must see!